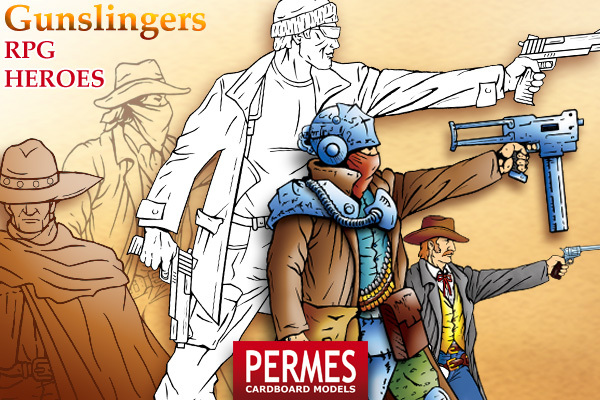 I've started a brand new set: Wild West RPG Heroes - with kinda obvious content like gunmen, sheriff, then various pistoleros, robbers, thugs et consortes and ended up with... semi-scifi, postapo characters like scavengers, marauders etc. I'd highly appreciate your suggestions! I dig this design it's gritty and has just enough realism to make it believable ! well done! 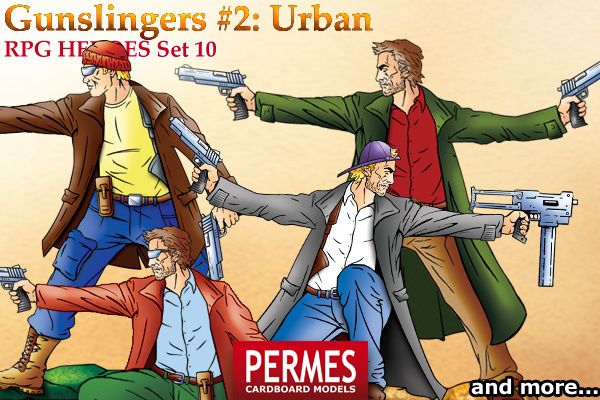 Maybe instead of Gunmen you should use something like Gunslingers or Gunfighters so it is a little less awkward if you decide to include some female figures. Other options include Sharpshooters (though usually applied to rifles, I think) Shootists (from a title of a 1970´s movie.) Shooters might work. What about "Outlaw Frontier" as the series' title? It avoids the use of "gun", so Native Americans with bows, axes and spears could fit with the Wild West sub-set, plus it also encompasses sword-swinging, knife-throwing, whip-wielding, etc., Wild West and Post-Apocalypse types. There are no pictures/images showing today. Anyway will try to solve it as soon as possible! Hey mesper, do you want to tell us what is going on with your site? Two weeks is a long time not to hear from you, especially when the last thing we heard is that your site was having problems. I don't wish to pre-empt mesper's reply, or to say more than I should, but as I've noticed a couple of other comments regarding broken site links here lately to other PERMES items, I can say I'm aware he's had a number of serious ongoing real-life issues over the last couple of years, which have rather come to a head in recent months. I know from past events on the CWF that we'd all wish him well for a positive and speedy resolution of these, and while it's frustrating not to have access to some of the things we might like just at present, I'd urge everyone to exercise a little extra patience, as I know he'll reply as soon as he's able. Oh... thanks for your concern and willing to help! Shortly - I'm fine but as wyvern noticed I have some issues I need to focus and resolve. Unfortunately and apparently my webpage is not the most important among these (but then, just to explain - I did some sort of mistake trying not to put all the eggs into one basket, so my domain-names and server/hosting providers were different - but it kinda turned against me, as one of these finished to provide service circa 4 months before It was supposed (and payed! ), so then their offer to prolong this shortened service was... ca 10 x more then just buying not only new one package but also upgraded/better one! There was some internet and hosting providers major players company mergers so most probably they lost some data/files. So some sort of mess started, which for me as an enduser is both annoying, silly and the worst perhaps quite time-consuming! That's not the money issue (although asking to shell out more than 100$ for just mediocre service used merely as file-server for download and free stuff might be considered as kinda robbery, even if it's on a year basis) - it's just matter of some principles. So I renewed all the domains and decided to transfer all the services to some other more trustworthy and solid hosting provider (well, funny thing is that the previous one was kinda OK during last few year, so how to choose?). 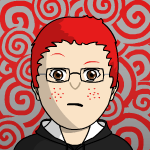 But then setting-up from scratch out all these accounts, passwords, ftp, e-mails, then backup and copying all the files into proper folders... it just take a time, accuracy and patience... and I'm kinda short with those at the moment. Now, I'd like to preserve all these free files and other graphics and made them public again - and luckily got most of these somewhere saved/backuped (still some could be lost I'm afraid), so restoring is rather matter of time and finding more convenient/reliable way how to do it. Anyway, I do appreciate and thank you all for your concern! Take your time and sort it out. We tend to 'want' things and want them now, but real life has to take precedence. I'm just glad that you are all right. Files can wait. I wish you all the luck in the world in dealing with these issues. mesper - glad to hear it is "administrative" problems rather than anything too serious. Hope your life outside of Permes is less stressful!! As Vermin King says, take your time to get things sorted out properly and I look forward to seeing more from you in the future. I for one am very grateful for all the content - free and paid-for - that you make available to the community!!!! But the basic idea behind all these remains the same! More or less the same basic figurine pose but different clothes, accessories and of course weapons. Oh well, and now I'm adding also "front-view" version to each "time-slot"
Awesome! I can't wait to see these when they are ready. 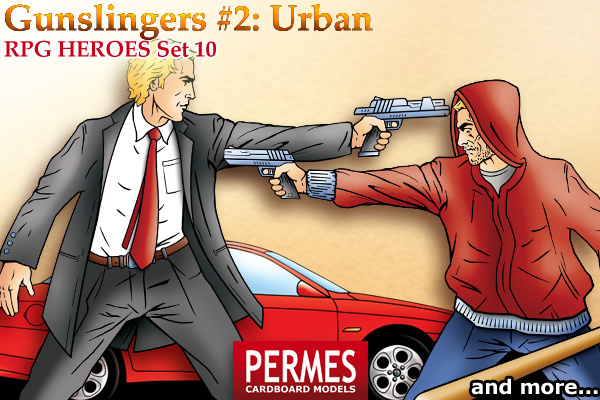 Gunslingers #2 incoming - this time Modern / Urban! Standing, kneeling, one and two-wielded, with modern guns, side-arms, machine guns, wearing suits and ties, leather jackets, and long coats, baseball and ski caps, different trousers, then with and without glasses etc. In other words a lot of modern street-fighters. Right now I'm working on some guy dressed in suit and (obviously red one!) tie, then I'm planning to equip these guys with some more varied/additional weapons. Of course various colour schemes provided. Dunno, IMHO this one should result in quite useful "handsome" set! PS. I'm still not sure how/when postimg is functioning (somehow some pics are one day visible then disappears... then later everything is back to normal), so that's why preview is doubled. I saw the preview image, then jumped to DrivethruRPG... then Wargamevault... finding nothing, came back here and only then I read "Gunslingers #2 incoming"
Still working on these... Now realised that some badass wearing training/sport suit with a hood and some trainer/sneaker shoes (kinda "gangsta-style") could be also useful. Nah, that's kinda never ending story - adding new elements, equipment, poses etc... So probably what I need is to "close" this set as it is before it gets too far and before deciding to postpone due to tiredness. OK here's preview with two new figurines: the one wearing suit and "baseball player" with additional appropriate... equipment. Here's some early preview with some characters. The central one belongs without any doubts into Post-Apo, as well as the right-side red-skin one (Hybrid or Mutant?). Then the left-side lineart (kinda Robocop-ish? could be both Sci-Fi and Post-Apo (sort of future police/law-enforce or spec-ops? ), but then the small robot or battle-droid in the left corner is IMHO rather pure Sci-Fi. Actually I can imagine a full-blown Sci-Fi set (so not within gunslingers mini-series!) based on this robot/droid, you know, kinda autonomous or remote controlled assault robo-squad or something like this. LOL just realised that the same might be done with hybrid/mutants... it's kinda "trap" actually! Why not keep the title simpler, and go for something like Gunslingers #3: Futuristic? I suspect you'll never please everyone picking and choosing between the various more specific sub-genres. Right, then the "Futuristic" title sounds fine for me - thanks! Then as usual some small variations will be implemented, like different helmets, faces etc. and slight pose changes in some cases as well.